Synopsis of badassery: The Fonz was the coolest of the cool in everything he said and did, a 1950s era personality who became one of the 1970s’ most beloved characters. Fonzie was an auto mechanic and all-around “tough guy” with a heart of gold, serving as mentor and protector to the kids who hung out at Arnold’s restaurant in Milwaukee. He had a penchant for leather jackets and Harley Davidson and Triumph motorcycles, but he didn’t smoke and mostly set a good role model. He had a way with the ladies and anything mechanical: he could make a juke box play his favorite song just by bumping it with his fist, or make girls jump to his side just by snapping his fingers. He was a man of few words, often saying just “Aaayyy!” or “Whoa!” or giving his signature thumbs-up sign. 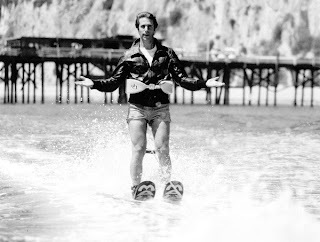 Several episodes revolved around Fonzie performing dangerous stunts on his motorcycle, and in one infamous episode he ski-jumped over a tank filled with sharks. 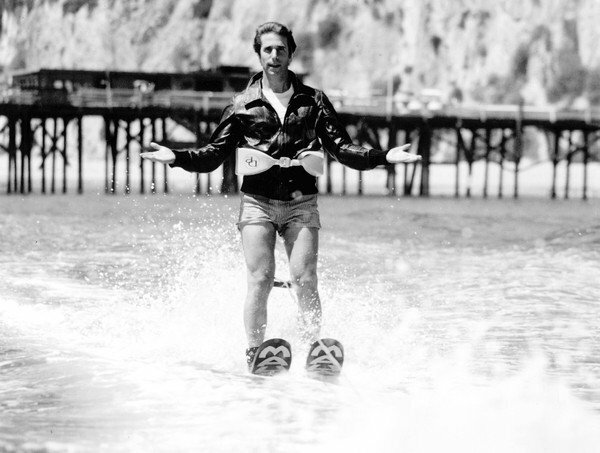 Badass website: What Would Fonzie Do? Icons of Badassery: Michael Knight and K.I.T.T.